This volume focuses on the highly debated topic of theatrical translation, one brought on by a renewed interest in the idea of performance and translation as a cooperative effort on the part of the translator, the director, and the actors. Exploring the role and function of the translator as co-subject of the performance, it addresses current issues concerning the role of the translator for the stage, as opposed to the one for the editorial market, within a multifarious cultural context. The current debate has shown a growing tendency to downplay and challenge the notion of translational accuracy in favor of a recreational and post-dramatic attitude, underlying the role of the director and playwright instead. This book discusses the delicate balance between translating and directing from an intercultural, semiotic, aesthetic, and interlingual perspective, taking a critical stance on approaches that belittle translation for the theatre or equate it to an editorial practice focused on literality. Chapters emphasize the idea of dramatic translation as a particular and extremely challenging type of performance, while consistently exploring its various textual, intertextual, intertranslational, contextual, cultural, and intercultural facets. 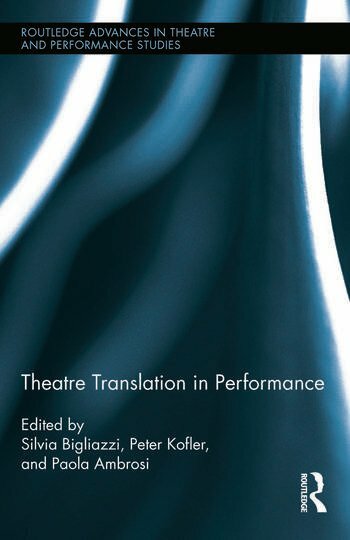 The notion of performance is applied to textual interpretation as performance, interlingual versus intersemiotic performance, and (inter)cultural performance in the adaptation of translated texts for the stage, providing a wide-ranging discussion from an international group of contributors, directors, and translators. Paola Ambrosi is Associate Professor of Spanish Literature at the University of Verona, Italy. Silvia Bigliazzi is Professor of English Literature at the University of Verona, Italy. Peter Kofler is Associate Professor of German Literature at the Department of Modern Languages, University of Verona, Italy.